Before we start on the promised discussion of iə and related topics, let’s have a bit of history. 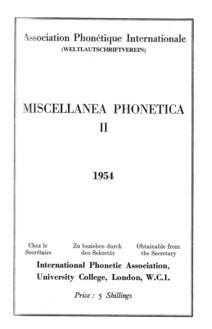 In 1954 Daniel Jones published an interesting article entitled “Falling and Rising Diphthongs in Southern English” in Miscellanea Phonetica ii: 1-12 (issued with Le Maître Phonétique). The article starts with a general discussion about two types of diphthong, ‘falling’ (with decreasing sonority) and ‘rising’ (with increasing sonority), distinguishing both types from simple sequences of two vowels. The ‘common’ English diphthongs ei, ou, ai, au, ɔi, he says, (i.e. the FACE, GOAT, PRICE, MOUTH and CHOICE vowels, which we nowadays write eɪ, əʊ, aɪ, aʊ, ɔɪ), are all ‘falling’. ‘Rising’ diphthongs are ‘uncommon’, but as an example of one he adduces the ĕo of Tswana. He then discusses ‘the vowel elements of words like ruin, bluish’. There may, he claims, be either a succession of two short vowels (ˈru-in, in today’s notation ˈrʊ.ɪn) or a falling diphthong (ruĭn, = rʊɪ̯n); as a third possibility there may be a long vowel plus a short one (ˈruːin, = ˈruːɪn). In unstressed positions, on the other hand, as in valuing, the possibilities are again a succession of two distinct vowels or a diphthong; but this diphthong is ‘generally a rising one, ŭi’. Furthermore, ‘in many such words there is an alternative pronunciation with wi as well as u-i. Thus valuing may be any of ˈvælju-iŋ, ˈvæljŭiŋ, ˈvæljwiŋ (= today’s ˈvæljʊ.ɪŋ, ˈvæljʊ̯ɪŋ, ˈvæljwɪŋ). Although it may be difficult to distinguish between these possibilities, ‘the distinctions are possible, at least in theory, and are probably felt subjectively by the speaker in slow utterance’. Words with the rising diphthong, such as hideous, easier, luckier, colloquial, theoretical, should be compared with those having a secondarily-stressed, falling diphthong, such as reindeer, Bluebeard, wheatear, realistic. With reindeer (falling diphthong) we can compare windier (rising diphthong or sequence of two separate vowels). The rising-diphthong words “are sometimes said with two syllables and sometimes with one [, which] is shown by their variable treatment in verse, where the metre sometimes requires two syllables though more often, it would seem, one.” Jones adduces two lines from Hamlet, in one of which the word audience requires disyllabic pronunciation, and in the other trisyllabic. Jones then applies a similar analysis to the uə-type sounds in fewer, renewal; tour, poor, skewer; contour, tenure, uranium, neurotic; influence, valuable, statuary, puerility, and again finds in Shakespeare lines in which virtuous must sometimes have two syllables, sometimes three. He finishes by considering further possible rising diphthongs in words such as narrower, follower, coalesce; shadowy, yellowish, coefficient; forayer; essayist, archaism. In the eleventh edition of his EPD (1956) Jones introduced two new symbols, for the rising diphthongs in happier (ĭə, corresponding to LPD’s i‿ə) and influence (ŭə, corresponding to LPD’s u‿ə). When Gimson took over as editor, he abandoned them. In LPD I followed Jones in recognizing the various RP possibilities for these words. So I show museum , for example, as mju ˈziː‿əm, while fierce is just fɪəs. In mju ˈziː‿əm the italicization of the length mark shows that the first vowel may be short rather than long, while the compression mark indicates that between z and m we may have either a sequence of two separate vowels or else a falling diphthong, so that the word as a whole may consist of either three or two syllables. Inspired by Jones’s pair reindeer — windier, another phonetician (I think it was Bjørn Stålharne Andrésen, but I can’t lay my hands on the reference, so this is from memory) performed a listening experiment in which he got speakers to imagine that as well as reindeer and roedeer we also have a kind of deer called a windeer; he asked them to pronounce in suitable carrier sentences the words windeer (kind of deer, with its falling diphthong in the second syllable) and windier (more windy, with its putative rising diphthong), and then played the results to listeners who were asked to decide which of the two words had been said. They proved unable to do this with better than random success. So the distinction between NEAR (my ɪə) and happY plus schwa (my i‿ə) may indeed be ‘felt subjectively by the speaker in slow utterance’, but the hearer cannot reliably detect it. > "I like to quote the British national anthem, in which -ious has to be disyllabic in happy and glorious, and compare it with the hymn Glorious things of thee are spoken, in which it has to be monosyllabic." ...and heaven is regularly one syllable! I find it hard to think of theoretical as having a rising diphthong. I agree. This is true of a few words in which NEAR precedes /r/ (in a non-rhotic accent). I'm not sure how Geoff Lindsey treats these cases in his work (which suggests that NEAR has disappeared and been replaced by FLEECE + schwa). Perhaps the part about the monophthongisation of this sequence applies here. I think that my vowel in the first part of these words is usually half-long ɪˑ, but half-length marks are unconventional when transcribing English. How do others feel? I would sing ˈglɔ:rjəs with, I believe, no diphthongal quality either to a hearer's perception or to my subjective intention. Incidentally, the metre of the hymn tune puts the syllable boundary clearly after glɔ:. Well, yes, same for me. I'll discuss the j and w variants on Monday. That's interesting. I thought BrE had r only before a vowel, but ˈglɔ:rjəs seems to violate that rule, and so does ˈvɪrjʊlənt. So did I, until that illusion was shattered by a post on this very blog around 18 months ago. As a rhotic speaker who lives among the arhotics of London, I must admit I'm still a bit sceptical. I've been listening out for rj in the wild, but I haven't spotted it yet. I was taught to sing [glorjos] in hymns, as in Glorious now behold Him arise. In more relaxed singing, it would be [glorjəs], in speech, [glori.əs]. Of the words mentioned above, I have monosyllabic pronunciations only in clear, fierce, nearly, hearing, rear, career, reindeer, Bluebeard, wheatear (all with /ir/), tour, poor, contour (all with /ur/), tenure /tɛnjər/, neurotic /nurɑtik/ (no diphthong), valuable /valjəbəl/, puerility /pjərɪlɪti/. As I've mentioned before, real(istic) has a centering diphthong before the dark /l/, making it /riəl(ɪstɪk)/. What's the second vowel in [glorjos]? GOAT? No, a real monophthong — my GOAT is [oʊ]. We had a lot of practice singing [eːːːːː] and [oːːːːː] and cutting it off sharply to suppress the off-glide. ˈglorjos for glorious seems bizarre to me. I'd sing ˈglɔ:rjəs myself. So would I, and so I do when singing alone, but the choir director insisted otherwise. Jack Windsor Lewis has kindly supplied the missing Andrésen reference: mf 1957 pp35-37, "-dier ənd -deer ; ən iksperimənt". I have never understood why the GOAT vowel referenced in John’s posting, a falling diphthong once transcribed as /ou/ and later as /oʊ/ or /oʷ/, could have come to be transcribed as /ɘʊ/. How and why did that happen? Because it’s a **falling** diphthong, the first vowel must form the nucleus of the syllable, with the second one acting as a semi-(vowel/consonant) or glide to finish it up, so [ɘʊ̯]. That then presents a schwa as a valid syllabic nucleus in a stressed syllable, which runs counter to my understanding of the role of the schwa in English phonology. Can anyone, especially John Wells, explain the thinking behind this? Growing up in the Upper Great Lakes region of North America, I may have an unconscious blindspot here, as I certainly have Canadian raising in my /aɪ/ phoneme becoming [ʌɪ̯] in my *tight* but staying [aɪ̯] in my *guide*. 1. It's not ɘʊ but əʊ. 2. This notation of the RP GOAT diphthong was introduced by Gimson in his influential Intro to the Pron of English. 3 . 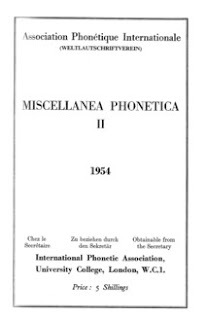 The notation does not imply that the diphthong has anything to do with the /ə/ phoneme, but just that its first element is a mid central vowel unrounded quality, i.e.[ə]. 5. It would be more sensible to send me an email direct rather than put a comment on a blog entry from years ago that I may or may not see. (j.wells@ucl.ac.uk).